Almost ready for my maiden and went to check my CG and it's way tail heavy. To balance it I need 2 x 2200 3s batteries in nose. Is the FT explorer usually tail heavy like that, would my single layer packing tape add that much? I wonder if my servos are to far back, I had shorter control wires... but to equal the weight of a second battery? Now I am worried I not have enough thrust, I am using a EMAX 1200kv CF2822 with an EP8040 prop if I need to use the two 2200 3s batteries. 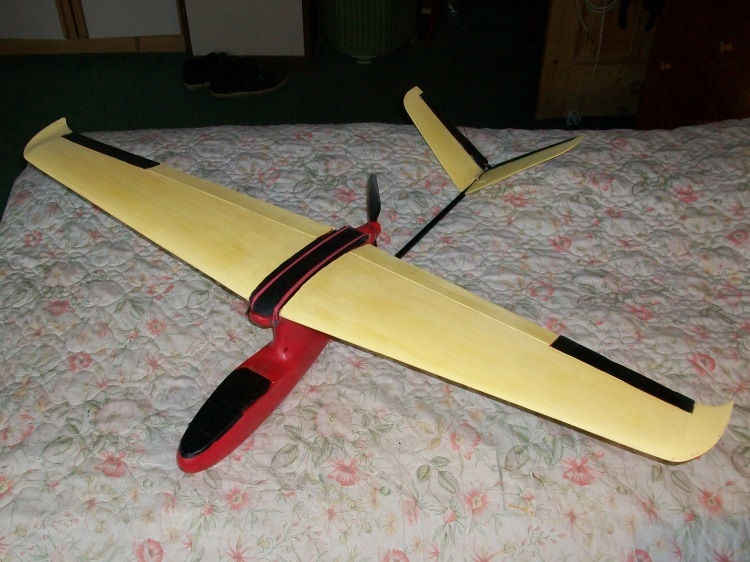 I also build a 5.5 inch armen wing with 1.5 inch non flapable (common reaĺly a word? ) control surface at 60 inch wingspan.. I had no idea this thing was so large! That power system has some punch, it should fly fine with two batteries. Might feel a little heavy and require some speed. Looks good but as you have found out any extra weight at the tail needs 3 or 4 times the weight added to the nose to compensate and packing tape is relatively heavy! So the answer is not to add more batteries, which will only create further problems, but to move the existing weight forward and if all else fails make the nose a bit longer to accommodate it! An 8x4 on a 2822 (are you sure it is 1400kV? the spec says 1200kV)) is rather small so the motor will not generate its full power. A 9x6, or even a 10x5 if you can get one, would be better but I doubt there is sufficient prop clearance. Failing that a 2812 motor (1600kV) would create full power with an 8x4 on a 3s. In all planes weight is a key factor so for successful flight so don't add weight, add lightness! Even if that means the plane might be a bit more fragile. It can always be repaired. You could also shorten the tail boom to bring the CG forward. I agree with the above, make nose longer and/or tail shorter. Your much better off moving existing weight forward than adding weight. I use packing tape in all my builds, I don’t think it adds that much weight. To make the nose longer, cut it off about where the windshield begins. Then add a few inches of foam, glue everything back on and tape over it. 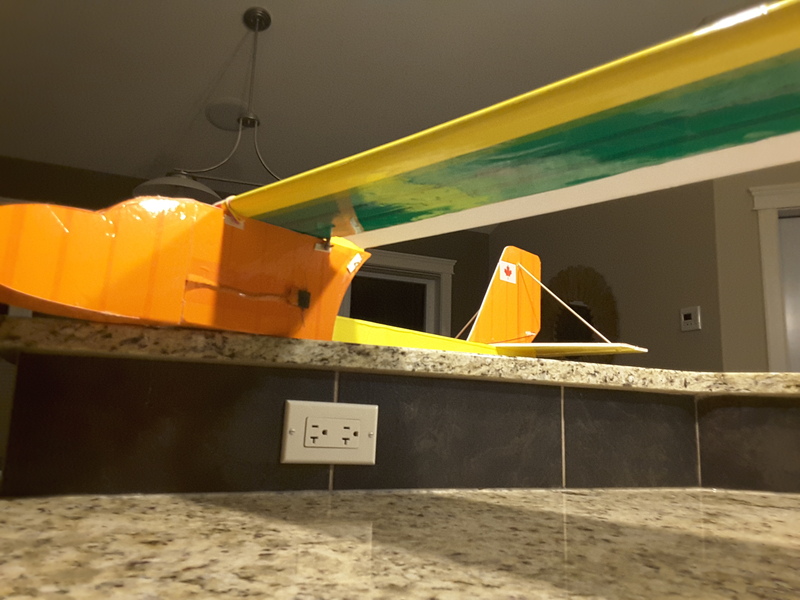 As I found out building the tape made it very hard to slide the boom in, I would try to slide it further forward to shorten the tail but its jammed in there pretty good. You guys are good, yes its a 1200KV changed in post. I have an A2212 1400KV motor and a DX2205 2300KV. I'd cut the nose off here and add in a few inches of foam on all 4 sides, then tape over it. Two thumbs up for your Merv! That is much easier than what I was thinking, rebuilding the whole nose. 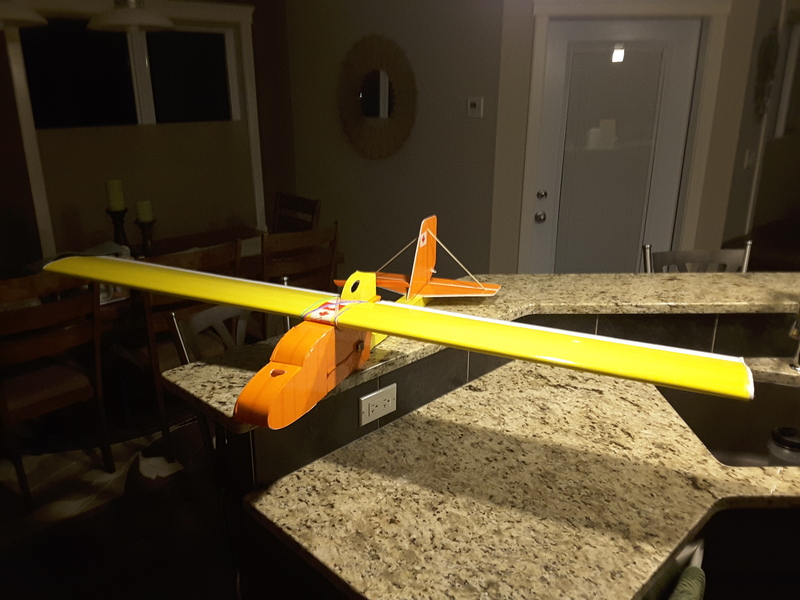 I will hotglue some Popsicle sticks under the airframe where the battery goes, move the battery forward enough to get some nose down weight on it, once I know where that is, cut as you have indicated and add the foam. Hey I have gone form dread to making these adjustments to excitement!! Let the destruction begin. Actually this is he first time I have had to bind a second receiver to my radio. Does my, or is my DX6 still bound to the first receiver as well? is my DX6 still bound to the first receiver as well? Yes, you can bind many Rx to one Tx. Each Rx can only be bound to one Tx at a time. Yes indeed! The object of extending the nose would be to simply to allow the battery to go further forward! Remember it is not just the kV rating that matters but the max Amps the motor is designed to handle. The A2212 has a maximum current rating of 12A (for 60 seconds) so about 120W power on a 3s with the right prop. The DX2205 is even smaller. I suggested the Emax 2812 as it is just a higher kV version of the Emax 2822 you already have which means it is better able to turn a smaller prop faster but produces the same maximum power whilst doing so, typically 15A (150 Watts) on a 7x6 and it is even slightly lighter at 39 g against 46 g for the less powerful A2212! This humble and now rather old 40" span pusher uses an Emax 2812, 7x6 prop, 30A ESC and a 1500 mAh 3s. It draws 16 A (155 Watts) and the battery has to to be jammed right into the nose to get the right CofG! The cut the nose off trick, also works with crash damaged parts. Packing tape repairs are far easier than paint. No need to reinforce the joints, they are plenty strong enough. Is the boom glued into the front of the fuselage? Rather than try to jam it further forward, you can remove it and chop it shorter. This doesn't require longer pushrods, but shorter ones. Haven't built one of these myself. 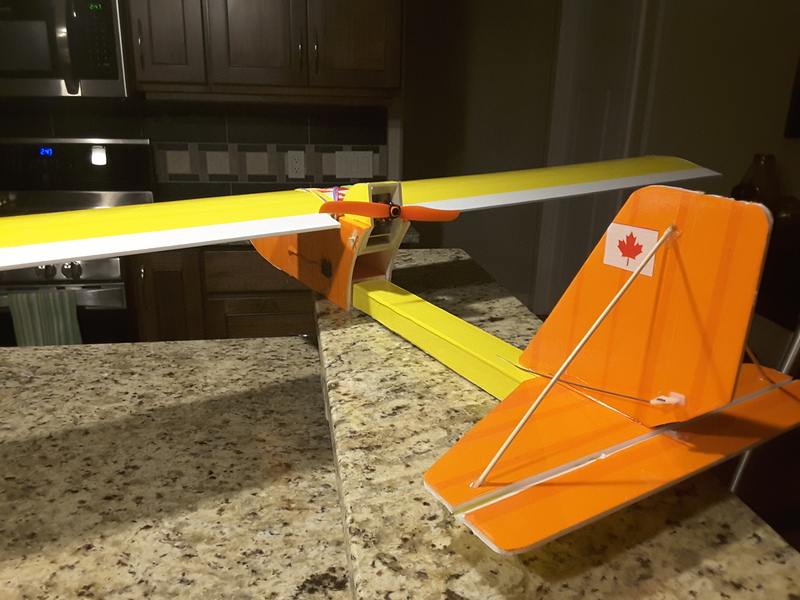 If your servos are glued to the boom somewhere that keeps you from chopping it, I don't think it would take much to cut the tailplane away and just build a new boom. Sounds like you are on the new nose path though and that will work as well, though it adds weight instead of removes it. If you happen to get the boom out, baby powder does wonders for allowing things to slide easily. Had to use on my Explorer, which also came out very tail heavy. I wound up pushing the boom and battery as far forward as possible then had to add some weight. 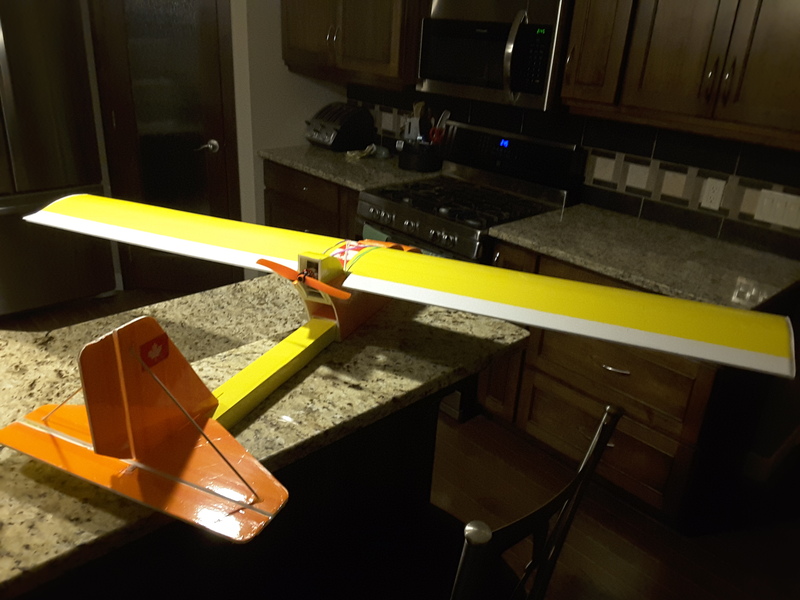 Flew well with the C pack on a 9x6 (prop cleared boom by a scant 1/4"), until I threw on an Armin wing and tip stalled at low altitude on a gusty day...may she RIP. This would work but if you shorten the tail to much, you would be shortening your tail moment which could lead to the tail surfaces being really sensitive. I wouldn't shorten the tail by more than about 2 inches, but instead lengthen the nose as other people have suggested. From one report I read on how the Armin wing works on this thing is they saw very little difference.... is there alot of different characteristics? Is is really just my third plan that I will 'successfully' fly. I am only 3 channel, am I to expect some squrilley flight characteristics? I am only 3 channel, am I to expect some squrilley flight characteristics? A 3 channel plane needs a bit of dihedral, to help them turn better. In a 4 channel plane you will not see much of a difference with or without the dihedral. There is not much difference between a 3 & 4 channel plane. The ailerons can have more authority, easy fix, just turn down the throws until you get used to them. Then crank them up so you can have some fun. You could always add polyhedral to the Armin wing. I was running a 2212 1000kv motor on my explorer. Was only able to swing a 8" prop if built per the video. There is room in the pod to move the motor mount up 1/2 or 3/4 of an inch up. This allowed me to run a 9x6 and flew much better... Till I lost orientation at dusk and flew it full speed into a hedge row. With no under camber it increases stall sensitivity and decreases lift. Add that to the fact I was probably too slow into the turn and I definitely was not at enough altitude to be able to pull out = crash. Up to that point it flew well.